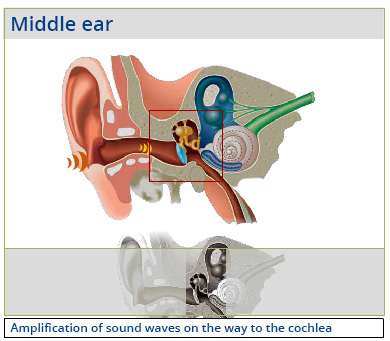 Hearing: The human ear can be devided into three sections: the outer, middle and inner ear. The outer ear consists of skin and cartilage along with the external auditory canal leading to the ear-drum. Sound waves cause variations in air pressure and are transmitted through the auditory canal to the ear-drum. The ear-drum vibrates to the beat of the acoustic stimulus. Middle Ear: The auditory ossicles are set into motion by the vibrations that occur when the acoustic stimulus reaches the cochlea. These amplified sound vibrations continue their journey from the outer ear to the cochlea. Inner Ear: As soon as sound passes through the cochlea like a water wave the sound wave induces oscillations in specific regions of the basilar membrane. Low pitches penetrate all the way into the cochlea while the higher pitches produce a response at the very front. Thus, a pitch allocation reap. a frequency analysis occurs. During oscillation, the basilar membrane is pushed towards the tectorial membrane. In addition, the external hair cells optimize and intensify the vibration characteristics. The internal hair cells contact the tectorial membrane, through with the very fine hairs will be bent. Electrical discharges occur which are transmitted via nerves to the brain. Once there, the acoustic stimuli are translated.